Yonkers Raceway hosts the final of the pacing classic, the Messenger, and though it lacks the ruler of the soph-pacing colt division, Captainstreacherous (see Hoosier analysis), the field is strong enough to perhaps deliver a cool upset. The sister event, the Lady Maud, offers its final, also with the division leader, I Luv The Nitelife, missing. The weekend also brings us back to Hoosier Park for some of its signature stakes finals. Check out the TwinSpires Pick-4 bonus at Hoosier, click here. The Simpsons Stakes for frosh guys and gals are covered in the Vernon section of the horses-to-watch list (H2W), which continues this week to pick up steam for its most prolific season. Check out the list below. The open draw for Saturday night, No. 2’s $450,000 final of the Messenger Stakes placed eliminations winners Sunfire Blue Chip and Lucan Hanover on the outside, in post positions 7 and 8, respectively. With strong but not necessarily stronger competitors lining up in front of them, the draw may offer a few steps or two to an upset winner. The 58th Messenger final is the eighth race at Yonkers and features 1-Odds On Equuleus, 2-Ronny Bugatti, 3-Word Power, 4-Good Day Mate, 5-Twilight Bonfire, 6-Lonewolf Currier, 7-Sunfire Blue Chip and 8-Lucan Hanover (Dave Miller). Just one post in front of the pair of elim winners that will obviously be the choices, is Lonewolf Currier. He may get the edge of the few steps possibly available if the outer two choices work too hard on the four turns. If he races as he did in the Invite that opened the Breeders Crown program, he could win this and pay handsomely. He has won here before and certainly seems in finer fettle than the first five on the gate. For soph-pacing fillies the companion stakes event is the $176,684 Lady Maud final. 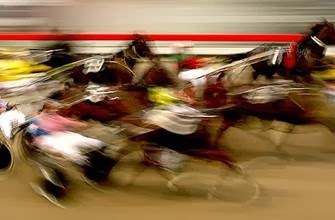 It’s the sixth race and features 1-Certified Ideal, 2-Handsoffmycupcake, 3-Antigua Hanover, 4-Charisma Hanover, 5-Scandalous Hanover, 6-Live Entertainment, 7-Parlee Beach and 8-Jerseylicious (“Scandalous” and “Parlee” race as a Casie Coleman trainer (and part-owner) entry. Charisma Hanover set a track record (1:51.4) for soph fillies winning her elim and the entry includes the $15,000 supplemental entrant Scandalous, so there is the majority of win money. It’s Antigua Hanover that may be the outside contender with the best chances. At 24-1 against Scandalous last week she held to an outside move and gained ground in the end to finish second. Hoosier’s big four stakes offer six-digit rewards and they hae attracted a number of fine national competitors. They are all presented on Friday, Nov. 1. We begin with the $157,000 Elevation for frosh-colt pacers. If we are looking for a possible price here we need to hope the inside colt, Totally Kissed, is dismissed for the more obvious pair in the field. This is one of the best colts trainer Brooke Nickells has had and she is earning well among tougher freshmen as she is three for nine wins with three other ont-the-board finishes. The $250,000 Monument Circle finds Captaintreacherous returning to the Indiana plant and facing nine other soph-colt pacers. He has beaten better and under more stressful conditions, so it is difficult to look beyond him once again. As a key we could pick up some exotic bucks with Emeritus Maximus and Apprentice Hanover. The main cast of older pacers ship in for the $223,500 Hoosier Park Pacing Derby, most coming from the Breeders Crown charges in that division. There’s little doubt that “Crown” champ Foiled Again and Pet Rock get the bulk of the win bets. Then you have Bolt The Duer, one of the most over-wagered-upon pacers of the past two seasons. He will get some money. There is talent left, though, and the major overlooked here may be Sweet Lou. There seems no other value possible here and we feel it safe to hope driver Ron Pierce goes winging with “Lou,” who has beaten these favorites before and returned a healthy double-digit mutual. Glamour-boy trotters from the contentious crop battling all season go in the $286,500 Carl Erskine trot. This field is closely akin to the division’s Breeders Crown final and no doubt Spider Blue Chip gets the public’s full attention in this one. That leaves Creatine to follow in the betting. We would like to see Tirade Hanover pull a shocker here because he may be a huge overlay. One of two from trainer Ron Burke’s barn, this guy has not lived up to his frosh season but has shown strong signs of life coming into this affair. It may be a stretch but then again we have to stretch it when there are favorites here that have proven vulnerable all season long.